Their ill-fated focus on identity politics holds lessons for other conservative parties around the world. Imagine a socially conservative, pro-business political party, one that champions free enterprise, deregulated markets, and globalization. Within this party is a faction that defends “traditional” values—the cultural, linguistic, and political identity of the people— from alien forces supposedly intent on erasing them. The party begins catering to this small-but-decisive group of voters. They help win elections. When the upstarts start taking control of sizable constituencies, the party’s old guard remains relaxed. Even if they gain real power, they won’t know how to govern. They’ll call us for help. But power slips through the leaders’ fingers. Then, the party’s fortunes tumble when massive financial crisis strikes and its leaders are marred by accusations of corruption. The old guard gives up its pro-business ideology and decisively embraces populism. The electorate, they warn, is being robbed by its enemies. It is time to restore power to the common man. Finally, the day arrives when the upstarts, the identitarians, take power, and cast aside the old guard. The debate is no longer about values, but power over the political system. Leaders become followers, and pragmatism is replaced with a maximalist mindset, where concession is conflated with treasonous capitulation. This is the story of Catalan nationalists—one that should sound familiar to Republicans in the United States, Tories in Britain, and even Conservatives in France. In the elections held yesterday to elect a new Catalan parliament to replace the previous one—disbanded by the Spanish government after Catalonia’s declaration of independence in October—the Democratic Party of Catalonia (PDECAT), running under the brand Together for Catalonia, finished in a virtual tie for second place with Democratic Left of Catalonia (ERC), which seeks an independent country made up of all the areas where Catalan is spoken. That PDECAT, known as Convergence and Union (CiU), until last year, is vying for second place is a testament to the foregone glory of a party that ruled the region for 30 of the past 37 years, and regularly received more than 40 percent of the vote. The party that nurtured modern-day Catalan nationalism and exerted total control over it, has lost leadership of the movement. At the root of this rupture is the obliteration of CiU, a coalition of two parties that held political hegemony in Catalonia through an agenda of social conservatism and free-market economics, and a campaign platform of nationalism and identity politics. Since Catalan nationalism is premised largely on a shared linguistic identity rather than on specific historical grievances or ethnicity, CiU focused its appeals accordingly, and to great success: The percentage of people in the region who are bilingual in Catalan and Spanish went from 25 percent in 1978 to 89 percent in 2013. Once CiU made Catalan the primary language in the region and established a governmental apparatus independent from Madrid, it had more or less fulfilled its promise. To maintain its relevance and popularity, it had to continue mobilizing its voters through nationalist appeals. The turning point for CiU came after 2010, when the euro crisis reached Catalonia. In 2012, the unemployment rate in the region was 22.5 percent; among those between 16 and 24, it was around 50 percent. The Spanish banking crisis also did not spare Catalonia: The region’s third-largest financial firm, Caixa Catalunya, was nationalized by the Spanish government—a particularly tough blow for a region that takes pride in its business acumen. CiU reacted by blaming Spain for Catalonia’s economic struggles, and by transforming any criticism of its leaders into an attack on the region. Corruption also eroded the credibility of the Catalan leadership. In 2014, Jordi Pujol, CiU’s undisputed leader, acknowledged holding secret bank accounts in tax havens for 34 years. He dismissed the accusations as irrelevant, charging that the tax evasion case against him was, in fact, an attempt by Spain’s conservative government to undermine Catalan nationalism. Pujol is still facing a fine for tax fraud between 1.5 and 15 million euros ($1.8-$18 million). The collapse of the economy and the corruption scandals destroyed the voters’ trust in CiU; the coalition, in turn, reacted by blaming the Spanish government for all that ailed Catalonia. The CiU called the first big independence demonstration in September 2012 in the middle of the recession, just as accusations of corruption against Pujol and CiU were gaining ground. Since then, the CiU has cut social spending while increasing funding for separatist organizations. Despite this effort to wrap itself in the flag of Catalan nationalism, CiU has never regained its popular support. Years of stoking the fires of populism and nationalism convinced the Catalan nationalists that CiU/PDECAT is too corrupt and accommodating of Madrid—never mind the fact that it has been the major force behind the quest for more self-rule since 1980, and for independence since 2012. For moderates, PDECAT has become too ideological, and for the ideologues, too moderate. For many Catalan nationalists, a Convergente—the colloquial name for a CiU, and, now, a PDECAT voter—is the rough equivalent of a “Republican in name only” (or a “RINO”) for a Trump Republican. Some of the implications of this extreme populist swing are grotesque. While Catalonian separatists lack their own ‘Pizzagate,’ some in the movement boast of a “conspiracy history” of sorts through which they reinvent Catalonia’s past—a supposed golden era of independence and prosperity to be restored. And what a golden era it was, if you believe institutions like the New History Institute, which aims to recover the “true History” of the region, one that has supposedly been “systematically distorted and manipulated since the fifteenth and sixteenth centuries” by Spain. The institute claims, for instance, that Christopher Columbus was Catalan and not Italian, and that his first voyage to America in 1492 launched not from Andalusia but Catalonia. It also claims that Leonardo da Vinci, William Shakespeare, and Erasmus of Rotterdam were all Catalan. Such ludicrous claims serve a purpose: to reaffirm that Catalans possess a distinct culture and history, and that they have been victims “of the biggest robbery in History” by Spain. The Institute has received financial support from the Catalan government and municipalities controlled by the nationalists. 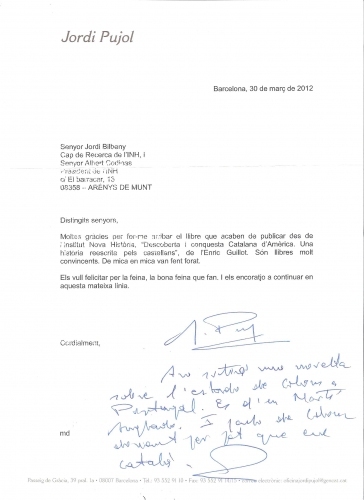 On a popular Catalan television news program in March 2012, Pujol praised the institute and its work. Two years later, then-Catalan vice-president and leader of ERC, Josep-Lluis Carod Rovira, attended a book signing of one of the heads of the institute and denounced the “bestial operation” undertaken by Spain to falsify history. For many Catalan nationalists, independence seemed a fait accompli—Spain could not afford to resist, they believed. These nationalists fell under the spell of their politicians, who promised that the European Union would accept an independent Catalonia as a member, one with “the unemployment of Denmark, the infrastructure of the Netherlands, and the educative system of Finland,” as Artur Mas, the former Catalan president and leader of PDECAT, promised. Catalan nationalists did not bother to come up with a plan for countering Madrid’s quite predictable opposition. When facing failure, populists’ favorite scapegoat is their followers’ lack of purity. So they double down. The fact that almost 3,000 companies, led by the two largest regional banks, have moved their headquarters out of Catalonia since the proclamation of independence back on October 27, has led some nationalists to propose the creation of a Catalan state-owned bank. Others, including Puigedemont, have declared that since the EU has shown no sympathy for the region’s predicament, independence from Spain must be followed by breaking up with the bloc—a striking testament to the transformation of a movement that once championed Spain’s opening to the rest of the world. That push for maximalism is reflected in the results of Thursday’s polls. Independentists did not expand their popular support, which remains around 50 percent of the electorate, thus denying them the mantle of legitimacy to proclaim independence. But, it is a far more radical, populist, identity-driven independentism than ever. Now, Catalonia is more polarized than ever, particularly in the wake of the election. This is due not only to the fragmentation of the secessionist vote, but to the fact that center-right Ciudadanos won the election. Ciudadanos is now the first non-CiU (or CiU-dominated) party to become, by a clear margin, the most voted-for in Catalonia. Unlike the Socialists, the traditional main unionist force, Ciudadanos firmly believes that Catalonia does not need more self-government. So now, nationalists and unionists are more distant than ever. Neither holds a majority to impose its views, or even, perhaps, to rule. And the chances of dialogue are virtually zero. This is the current state of the traditional Catalan nationalist movement. Any realism has been discarded or is even seen as treasonous, in favor of Catalonia’s very own brand of identity politics. Surely there’s a lesson here for conservative parties around the world? Pablo Pardo is the U.S. correspondent for El Mundo.